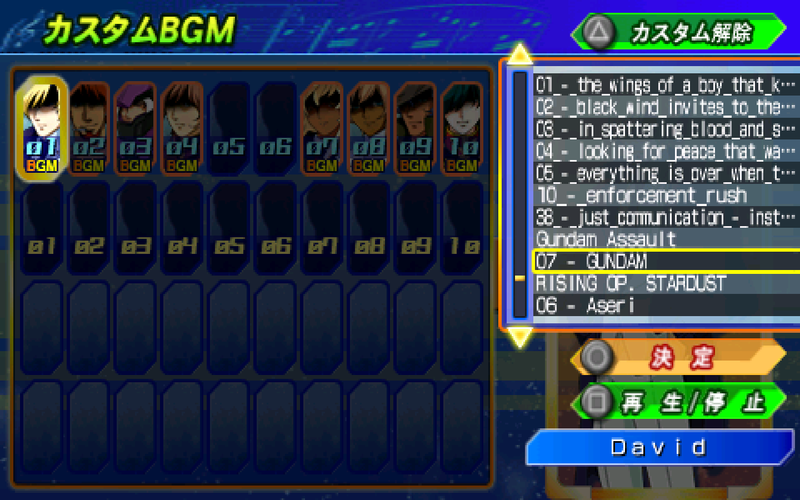 Then, load up G GENERATION OVERWORLD and visit the character BGM player in Gallery section. If you've done it right you should be able to press a button to assign a custom song to any character! When that character enters battle, it will play your song. Using your own music tracks in the game is a great new feature of G GEN Overworld. It's quite easy to do. You will need to have a PSP with a storage card installed, and a USB cable for the PSP. You should see a variety of folders. We need to make a NEW folder, rather than navigate to one of these folders. You have to make a folder called MUSIC on the storage card. Open the MUSIC folder you just made, and create another new folder inside of it called OVERWORLD. Now, drag and drop MP3 files into the OVERWORLD folder. Once they are done copying to the PSP card, end USB mode on your PSP and unplug your device. You are done! Please do not discuss game piracy or emulation on the wiki, thanks. PSP's using old, non-official firmware may have issues playing the custom BGM's. A: Download Audacity (freeware) and the LAME mp3 DLL to export MP3's with it. You can load your MP3 into Audacity and export an MP3 that the game should read. It is currently unknown why some songs refuse to play. Possible candidates are song size or length. You can use Audacity to edit and trim your songs. *new* In Audacity change the Project Rate (Hz) to 44100 (can be found on the lower left). Q: Some/all of my songs sounds really quiet when the game plays them! A: I don't know why but it seems like the game does slightly decrease the volume of custom BGM at times. To remedy this, use Audacity's "Amplify" effect with "allow clipping" enabled, and amplify the sound a few numbers (3? 4? Play around a bit) Alternately, you can download and use the freeware program MP3Gain and adjust the decibel level of the MP3 until you are comfortable with it. This page was last modified on 5 October 2012, at 03:58.